There’s no better indicator for, or example of, San Diego’s global competitiveness than one of our very own Fortune 500 companies, Qualcomm. Qualcomm’s regional impact and global recognition offers the world insight into the broad scope and depth of San Diego’s economy. The company’s international presence adds credibility to other San Diego businesses to ensure they are globally competitive. Qualcomm has been a key factor in the healthy state of our region’s economy, and continues to prove itself as a globally competitive and highly innovative company. Qualcomm contributes $4.53 billion in economic activity annually, which is the equivalent of one and a half 2012 London Olympic Games. 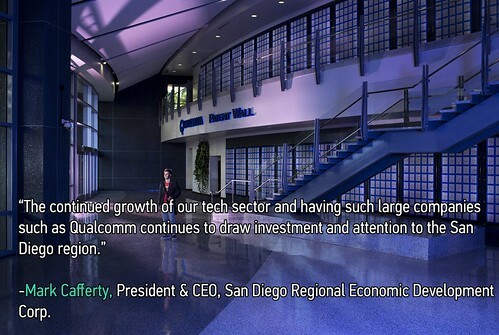 The company’s economic footprint in the San Diego region includes almost 14,000 Qualcomm employees. Additionally, each job created at Qualcomm supports three additional jobs locally. San Diego’s community is stronger thanks to the more than $85 million donated to local charities between 2000 and 2011. The impact of Qualcomm is a vital component of our region’s economic growth highlighting the significance of exporting as an important component for San Diego businesses to thrive and reinforce the region as a global competitor. Why should companies in San Diego go global? Qualcomm has proved that our region is well positioned for global success. The business environment here in San Diego is bustling with companies that are highly marketable on the global scale. Qualcomm is just one of several local companies in the scientific and technical service industries, a sector that grew by 9% in our region throughout the course of 2014. In order to sustain and increase this growth, we must look beyond our borders, recognizing our ability to compete IN A global market. On March 11 at San Diego’s Global Summit, Qualcomm and key leaders will launch the Global Trade and Investment Initiative. The event is SOLD OUT. There will be a webinar available to those who cannot attend. Details to follow soon. Subscribe here to receive new posts every Wednesday on this topic. San Diego Regional EDC's mission is to maximize the region's economic prosperity and global competitiveness.